I read this article and found it very interesting, thought it might be something for you. 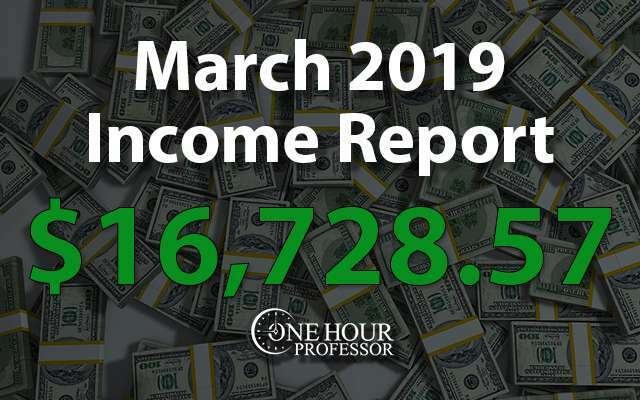 The article is called March 2019 Monthly Income Report and is located at http://www.onehourprofessor.com/march-2019-monthly-income-report/. I’d have to say that March of 2019 was one of the most difficult months I’ve ever had with my online business. This isn’t because my revenue has been falling, this was actually my second-highest earning revenue month ever, but it’s because two other difficult things occurred. First, my CK website was hit by the recent algorithm change and traffic dropped by about 50%. Because of that, I had to take some really drastic measures and I’m changing the entire structure of the site moving forward. I’ll detail more in the report, but it’s been pretty tough to deal with. Second, the JFFH website started to show declines in traffic and that’s a pretty scary feeling when it makes up about 75% of my earnings every month. After some reflection and figuring out what it is that I need to do, I can actually say that I feel better about my business today then I have in a while. I’ll get into why that is within the report, but I’m making some changes and already seeing positive results. This month my total income after expenses was $16,728.57 which comes out to $539.63 per day. Life continues to be hectic with the renovation of the house that we purchased at the beginning of the year. I’m happy to report that we’re coming to the end of the most expensive and difficult projects in the house such as electrical, flooring, and a kitchen remodel. Once those are done, there are still a few bathroom remodels we want to do and adding a fence in the backyard, but those are all small relative to the projects that we’ve been getting done. In March, I was able to focus more on my business and less on the house itself as we are simply hiring contractors for most of the work. But, it’s still a pain to deal with because there’s a lot of dust in the air and it screws up my daily routine pretty significantly when workers are here. Aside from that, my wife will soon be getting her green card and we can live like a normal family finally. Not a whole lot to report from a personal standpoint this month, we’re just chugging along and life is good. Oh, and before I begin on the actual report, If you’d like to begin a similar journey as myself and try to create a passive income online business, I recommend you read this write-up I did. It should help educate you before you begin to move forward. 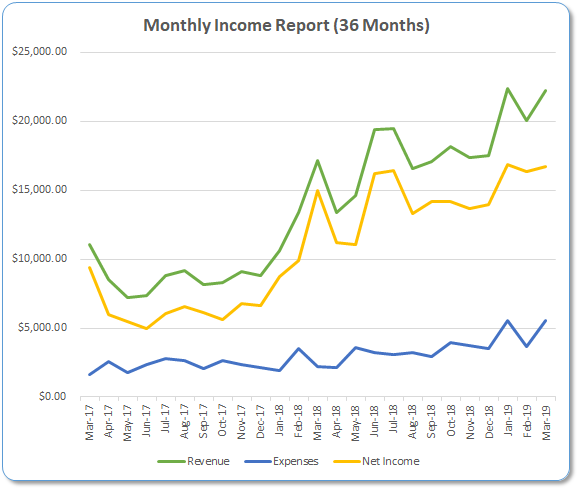 JFTHQ Earnings: The earnings of this website jumped quite a bit in the month of March and I think it’s a result of all of the guest posts that I’ve been doing lately. For the month itself, I was able to secure 15 new guest posts and this allowed me to grow the backlink profile of the website. As I did this, I saw a nice increase in traffic and earnings. JFFH Earnings: There was a pretty big spike in earnings this month and a lot of that is related to one of our partners and an increase in AdSense revenues. This is mostly because I’ve been revising content, which I’ll cover the results in later in the report. Freelance Writing: Though I still had a significant amount of writing done in February, the overall cost was down. Freelance Development: Though there were still some development projects to complete in February, development costs were down significantly as well. For the first time in a long time I really started to get nervous about this website in the month of March. Long story short, traffic was continuing to drop for three months in a row and though it was only dropping by 5-10%, in aggregate that can be pretty difficult to deal with. The content of the website is already decent, and I’ve got enough back links to succeed in the niche, so I did a little bit of soul-searching to figure out what it was that was going wrong. The conclusion I came up with is that the content needed to be refreshed. Plain and simple, there are plenty of articles on this website that I had written 3 to 4 years ago and I haven’t touched. I’ve been reading a lot about how updating your website content can yield some positive results, but I didn’t buy into the theories. Now that I’ve tried it and revised some pages, I’m seeing that I should’ve done this a long time ago. Though I’ve only revised five different pieces of content, I’ve seen an 8% increase in visits to the website and pageviews have increased by 10%. The total time that it took me to do this? Probably about three hours. The return on investment for the time spent is far beyond what I would get in creating new content and I think it’s a lesson that I need to make sure I’m revising content on a more regular basis. My strategy for the revisions has been pretty simple. I went to Google Search Console and compared the last three months with the previous three months. With that comparison, I was sorting by clicks to my content. This was able to help me identify what pieces of content had the biggest loss in traffic for these two time periods. I then sorted the data so that I could see the biggest losses and went into those pages and began editing them. The editing process was different for each page. To make the revisions I typically just looked at my content and compared it to those that are competing with me to make sure that I had the most helpful content on the subject. After I completed my revisions, I changed the published date in WordPress to the current day and then pressed publish again. After it was published, I went back into Google Search Console and submitted the URL to have Google crawl my page again. This process was pretty easy to do, but the results were pretty awesome to see. Prior to the revisions I could see myself ranking numerous times in the 3-4 positions, but then after revisions I was able to bump right back up to number one. In addition to that, I saw numerous occurrences where Google was showcasing my answer to a question in their knowledge graph at the top of the search results, but they were using my competitors’ image. I thought this was really strange because all of my text was at the top answering the query, but for some reason, my competitors’ image is what the search engine thought would be most appropriate. What I found was that after republishing my content and revising it to be a little bit better, my competitor images disappeared and the knowledge graph pulled my own website images again. I really have no idea why this is or the reasoning behind it, but I do know that I was able to revise things to make myself show in both spots again so I’m happy with the result. In the next few months, I anticipate revising a lot of the content on this website to try to win some of my traffic back. I can’t even imagine if I was able to get to the number one search results on numerous pages that I’ve lost in the past, but if I was able to do so there would be a significant bump in both traffic and earnings. Udemy Update: I no longer focus on Udemy and though it still gives me some income, it’s all passive. OHP Website Update: I no longer focus on this website outside of these income reports. JFTHQ Website Update: It was nice to see a jump of about 23% in traffic to this website in the month of March. I think some of this has to do with seasonality, but I think a larger part of it is because I’ve been focusing a lot on guest post link building. While I can’t say with 100% certainty that this is the cause of the traffic increase, I think it’s pretty apparent that the more links I get, the better this website does. Like the JFFH website, I’m going to look at some of the content here that has lost positions and try to revise it to increase my rankings in search engines. Beyond that, I’m going to also look at how to further increase earnings on the website. Per 1000 visitors, I’m making about a third of what I do on the JFFH website and I think that’s because I just haven’t thought hard enough yet on how to monetize the website. I didn’t actually increase the referring domains to this website by 68 this month. For some reason, I’ve been seeing a lot more spam links to this website and though I submitted a Disavow report to Google, they keep on coming. I have no idea why, but I intend on staying on top of this and will continue to submit these files if need be. Earnings had a nice jump of 23% this month, which is pretty solid considering I did very little to make that happen. This website continues to grow but it’s going to take a lot of backlinks to make that happen. It’s in a very competitive niche and though I’m doing okay, I think it could get much bigger. BCC Website Update: I was pleasantly surprised to see the earnings for BCC this month. I really haven’t done anything at all to make it better, but I almost hit $1000 in earnings for the month which is the target. I don’t really have many plans for this website right now other than letting it run on autopilot, but I may consider content revisions here as well if it makes sense. If you compare this year’s earnings versus last year in the month of March, there’s a pretty significant decrease. That’s only because the physical product that I sold last year was put on to Amazon in the month of March. This year I was able to get it up earlier which is why I made significantly more in December and January. It’s possible that the writing is on the wall for this website. Everything I’ve tried to do isn’t working and it’s getting to a point where I don’t know what to do any longer. I’ve been in this Internet marketing space for over five years and haven’t had a serious failure since year two. However, at this point in time, this website is looking like a huge failure. It’s a real shame to and it was really defeating because I’ve put so many hours into this website and so much thought. I genuinely feel like I have a good thing here, but Google doesn’t agree with me and hit the website pretty hard in the month of March with the new algorithm change. My traffic to the website dropped 43% MoM and my earnings decreased by about 50%. The only good news here is the fact that this was a small website in the first place and never really provided me with a lot of income. If you’re wondering what the issue is, so am I. The only thing I can come up with is the way in which I did link building. For quite some time I talked about how great database link building is and it may have worked against me here. This is essentially when you create a directory on your website, and then you have multiple people link to you because of said directory. While this did work for the BCC website without any issues, I think it crushed the CK website’s potential. Google was only sending traffic to these directory pages on the CK website. Because of this, it was really difficult for me to create affiliate content that would get seen in search results. I actually think that Google felt my website was mainly a directory vs. a general resource for people who are interested in the main topic of the website. This meant that even at its best, the traffic to the website wasn’t going where I wanted it to and the revenue generating component of the website was pretty weak. Because of this, I took some pretty drastic measures and have essentially destroyed hundreds of hours of work that my virtual assistant put in. At this point in time, I’ve unpublished all of the different directory listing pages that I have on the website. My hope is that Google is going to understand I no longer have a directory on the website itself and instead attribute all of the link equity that I built to the pages that still exist. If this happens, Google will begin giving higher rankings to the informational content and affiliate content that I’ve created on the website. If Google does that, then I’ll be able to still make significant earnings. If not, then I have to think about a new direction. I pulled down all of the directory pages on May 18th and to my surprise, I’m still seeing quite a bit of traffic getting sent to these pages by Google. Again, this is after I pull down the pages and resubmitted a sitemap to Google. My plan is to wait another couple weeks and then republish these pages with noindex/nofollow tags so that Google doesn’t index them at all. Truth be told, I still see a lot of value in what I’ve created but I don’t want Google to think that this is all that the website focuses on. If I don’t see an increase in non-directory content from these efforts, I’ll try to build a few more links to the website in hopes that Google will understand what’s going on. If none of this works, I may just try to sell the website for the domain authority rating and let someone else figure it out. We’ll see what happen, but so far it has been a VERY rough ride for this website. Don’t overdo directory link building. I made that mistake with this website and I think that this is what is hurting it so badly. If your website isn’t showing positive signs after 6 months, be concerned. I don’t know that this is a hard and fast rule, but the CK website has been struggling for a very long time and I think I should’ve paid more attention at month six to see if I needed to change my approach. Failure is always possible: No matter how long I’ve been in the internet industry, I need to remember that failure is just around the corner if I rush things. The CK website attempted to get a lot of links very quickly in an effort to rank on Google. I was able to get the links just like I had planned, but Google didn’t seem to like that. It’s a humbling moment for me and was a great reminder that life isn’t always rainbows in the world of websites and SEO. Content Revisions are Legit: I’ve been hearing about how content revisions help websites for at least a year but I continued to put it off. That was, until the JFFH website started to show a loss in rankings and then I decided I had to try this. Thus far, it’s been incredibly successful and now I’m just trying to figure out how to implement it across all of my websites. Make Great Websites, not a lot of decent websites: I think one of the things that has happened to me is I’ve been focused on so many projects that my quality has been slipping. The fall of the CK website is difficult to deal with, but it’s allowed me to refocus on what is already very successful and try to make more revenue from those sources. So far, it looks like a blessing in disguise. I was able to complete my development projects for the month of March. I’m going to be opening up a few new rounds of development projects in the month of April and my hope is that they move pretty quickly. This will probably be my last round of development updates for some time, which is good because I’ll be able to retain some more of the revenue that I’ve been generating. I’m happy to report that I was able to launch this website near the end of March. I still haven’t finished all the design of the website itself, but I’ve been able to publish 60 different articles and have started putting content out there. As I mentioned in my report, this was a very successful test and something that I want to do across more websites. It’s increased my traffic and earnings and seems to be something I should’ve done a long time ago. This task was going to be for the CK website and now that things have gone south, I don’t think it makes sense to spend my time and resources here. For now, this is a no-go. What Are my Goals for April? I use the Pareto principle when it comes to my websites. This basically means that 80% of the traffic and revenue comes from 20% of the effort. I think this is true and my goal is to edit the top 50 pages of content on the website and republish them. Though I’m already publishing content on this website, I’m doing so without a properly designed homepage. I really don’t think it matters at this point because I have the Minimal Viable Product out there, but I need to build out some category pages and make the website look more respectable. Though I’ve been able to secure a number of guest posts, a good friend of mine told me how he was able to land about 40% of his pitches for guest posting. How was he able to do it? He just said there was a lot more touch points than what I was currently doing. So, in the month of April I’m going to revise my outreach process to try to secure more guest posts. HI Ron, too bad about your CK site. Removing pages from a site is a quick fix that really coud help you. You wrote “… and to my surprise, I’m still seeing quite a bit of traffic getting sent to these pages by Google”. Google never forgets – I did a similar exercise as you did 4 years ago and every few month I see crawl attempts to these pages generating 404s in Search Console.